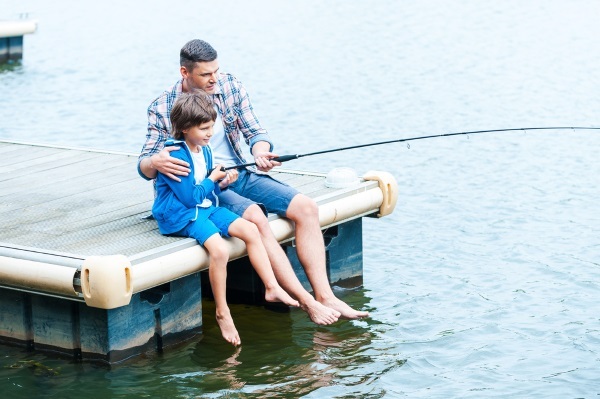 Still Fishing – Still fishing is normally referred to as bait fishing, where you get a baited hook somewhere in the water column, top to bottom, and wait for a bite. This is practiced in freshwater and saltwater. Breaking it down further, bait is presented either freelined, under a float or with a lead sinker. Sometimes chumming – putting additional scent in the water by means of frozen blocks of fish bits – can help draw more fish to the vicinity of your bait. Bottom fish can be best reached by adding enough weight to hold a baited hook on bottom even in swift current. A jig can be substituted and tipped with the bait, fished still or just bumped along slowly to cover more territory. Casting – A more active form of fishing, casting is done largely with lures, though some of the hardiest of live baits can be cast and retrieved in some circumstances. Spinning, spin-casting and baitcasting tackle can be utilized in both saltwater and freshwater. Casting usually requires distance and accuracy, or a combination thereof. Light tackle is easier to cast with repeatedly, due to its size, relative to heavier gear that serves best in bait-fishing situations. Retrieval of lures varies, depending on species and conditions, and the nature of the lure. With lures imitating or stationary or slow-moving prey, anglers should use a slow retrieval speed; the lures designed to look like baitfish can be retrieved at a sometimes high rate of speed. Generally, the colder and/or dirtier the water (or at night), the slower your retrieve is advised. Trolling – Dragging lures, rigged natural baits or live baits through the water is a great way to locate fish. The movement of the boat normally hooks the fish through tension on the line. Anglers have the option to troll exclusively, or stop and employ casting or still fishing methods once fish are located. In fresh water, especially for bass or speckled perch, anglers make sure to troll slowly over and adjacent to favorable cover, such as sunken trees and brush in open lakes, or along aquatic weed beds where bass lurk and ambush passing prey. For the most part, artificial lures are best for fresh water trolling. Use spoons and swimming plugs for bass and small jigs tipped with minnows for specks. Fly Fishing – A traditional method in fresh waters for bass and panfish, the execution of fly fishing is similar to that in the tips above for casting with spinning gear. Flies imitate the prey that other artificial do. Choose a fly outfit in the 3- to 7-weight class, and match with a reel spooled with a floating line. Make short casts less than 40 feet if possible, for accuracy's sake. Most bass are tight to shoreline cover. In saltwater, the stakes are higher due to size and strength of the fish. Eight- to 13-weight rods are best, depending on the species targeted. Casting can involve long or short presentations, to fish first sighted or to likely shoreline cover, jetties, structure, sand bars, manmade structures, anywhere there is strong current. Fly fishers in the salt should use sinking and floating lines, and choose them according to where the fish are in the water column. This style of fishing requires much practice, and it is advisable to take casting lessons from a qualified instructor, or look for instructional videos on the web. Many signs point to good fishing. In salt water, whether fishing by boat or from the shore, clean water and good tidal flow is a plus. Signs of baitfish schools, or birds feeding at the surface are sure signs of good fishing waters, as are other boats fishing an area. But use etiquette and do not move in on other boaters or persons fishing on shore. Jetties, inlets and creek mouths where current carries prey to gamefish. Some can be accessed on foot; otherwise boat anglers can anchor, drift-fish or troll around these locations until fish are found. Beaches can look fishy, but the best for fishing are often close to inlets or passes where swimming and general boat activity is minimal. Action can be best when baitfish are present – look for beaches where diving birds or on-shore activities are common. Bridges with catwalks and public piers provide access and actually attract fish due to the fact that the structures provide protection for baitfish that attract bigger fish. Whether boating or wade fishing for a roadway, look for shallows where grassy bottom is common. Grass provides cover for baitfish, shrimp and crabs and thus normally holds gamefish. Spots like this are best when the tide is moving. Reefs and wrecks are usually marked as public numbers on fishing charts, so are easy to locate. These are magnets for a variety of saltwater fish, and even those not notated on fishing charts can be found with even inexpensive bottom sonar machines that most saltwater anglers have aboard the boats. Otherwise, a pair of polarized glasses can help you spot the darker reefs in anywhere from 20 to 80 feet of water. Generally speaking, you can't go wrong by acquiring a good fishing chart of your area to learn to read the features on the chart with the key to symbols referring to depths, channels, shallows, and all kinds of fish-attracting features. Google aerial photos are excellent ways to see what is below the surface. Nothing tops eating fresh-caught fish after a successful day. And nothing is worse than letting your catch spoil before it hits the table. The key is to ice your catch well. The basic rule is to use a good cooler, such as the roto-molded models on the market. They are well worth the price if you routinely keep fish for the table. And most midsize to large boats are equipped with fish boxes. Consider carrying three to five pounds of ice per every pound of fish kept. Ice can be kept longer with the addition of synthetic "cooler packs" that can be reused. Make sure water from melted ice is drained regularly from the cooler. Do not allow fresh water to contact your iced fish. In fresh water and salt water anglers who wade from shore or from the boat routinely keep fish on a stringer. Once a fish dies however, it must be iced, and there is always the threat of attracting sharks, and in fresh water, alligators, so keep that in mind. Once at the cleaning table, an ice cold fish easiest to clean. Small fish can be gutted and beheaded, and scaled if to be cooked whole. Larger fish are best when filleted (and skinned or left with skin on), or steaked with skin left intact. Filleted fish can be fried, broiled, grilled (with skin on) or baked. Baking is best with whole fish. Should you choose to freeze your catch, invest in a vacuum sealer (such as a Seal-a-Meal or a FoodSaver) and appropriate sealer bags. They remove air, which can cause freezer burn. For short-term freezing, a ZipLoc bag will suffice. On average, you can keep fresh, cleaned fish in the refrigerator for up to three days, so be prepared to freeze your catch so it does not spoil! Soft plastics – From molded lures to imitate worms, baitfish, crabs, eels, shrimp and more, normally soft plastics have a single imbedded hook, or can be rigged on bare hooks or jigheads. Some float, others suspend or sink slowly. Most come in sets of treble hooks, and often have rattle chambers to make sound. Fish these in shallow waters without added weight; if you are fishing in deeper waters, add a splitshot sinker, or rig the plastics on a jighead weighing between a quarter- and a half-ounce, depending on the depth. Jigs and spoons – Jigs are normally lead heads dressed with materials such as feathers, deer hair or synthetic fibers. They normally sink to bottom quickly. Spoons are shiny and metallic and are shaped to wobble enticingly when retrieved. Use a loop knot with these for maximum freedom of movement. Spoons can twist a fishing line when retrieved at a fast rate. Decrease this by tying on small ball bearing snap swivel to your line and then snapping the spoon to it. Hard baits – Consider these plastic or wooden "plugs" that can imitate all of the prey species in either freshwater or saltwater. Some float, and others suspend or sink quickly. Many have rattle chambers that emit a fish-attracting sound, and others have shapes that cause turbulence as they pass through the water, which helps fish locate them at night, or in muddy water. Most have sets of treble (multiple-point hooks) though anglers sometimes switch them out for single hooks, especially when they plan to release their catch alive. Be aware that fish tend to miss a topwater plug at the surface. Be patient when fishing these, and allow the lien to come tight before setting the hook. Use lightest line and leader for maximum action. Spool with braided line for sensitivity and low stretch to better set the hook. Use flashy lures in stained or dirty water. Apply liquid scents to lures when fishing is slow. Switch out a plug's treble hooks when not fishing for the table. Flatten the barbs of all lure hooks to make releasing fish easier. Always use a clear mono leader when casting lures with braided line. Use spinning tackle for the lightest of lures for maximum casting distance.